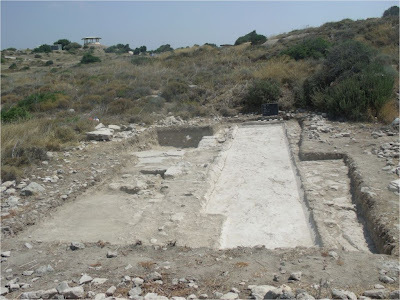 The Ministry of Communications and Works, Department of Antiquities, announces the completion of the first season of a new long term archaeological investigation at the site of Kourion, Limassol District, titled “Kourion Urban Space Project”’ (KUSP) and directed by Dr. Thomas W. Davis of the Tandy Institute for Archaeology at Southwestern Baptist Theological Seminary in Fort Worth Texas , USA. Dr. Davis was formerly the Director of the Cyprus American Archaeological Research Institute in Nicosia from 2003-2011. The KUSP consortium includes the Australian Institute of Archaeology and the University of Cyprus. KUSP will build on previous work at the site including the recent Kourion Mapping Project (KMP) in order to gain a better understanding of the urban space of Kourion and by extension of late Roman Cyprus. Dr. Davis served as the Principal Investigator of the KMP after the untimely death of Dr. Danielle Parks. At the request of the Department of Antiquities of the Republic of Cyprus, the KUSP team of graduate students and established scholars changed the planned location of the initial excavation trenches in order to examine an area of the site that had never before sampled archaeologically. The project research area lies southeast of the basilica and southwest of the “Earthquake House,” along the edge of the site. While the excavation of three 3 x 3 m trenches was being undertaken within the project area, the KUSP team discovered evidence of three separate mosaic floors eroding along the cliffside. At the request of the Department of Antiquities, the KUSP team partially excavated and prepared for conservation, two separate mosaic floors and one fragment of a floor. 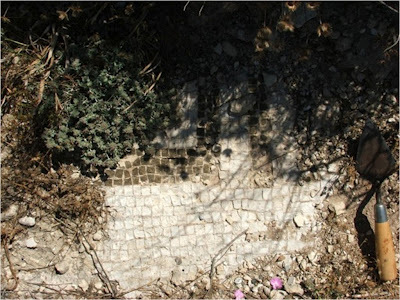 The mosaics had been exposed by winter rains and were very vulnerable to further erosion. The fragmentary floor, composed of white tesserae, measured approximately 50 x 50 cm and was associated with a cistern. Immediately north of this fragment an apparently intact mosaic floor measuring at least 5 x 3 m. was exposed. The floor is composed of stone tesserae with at least three different colors; it is possible that it will include a figural mosaic, but the remainder of the floor awaits excavation in future seasons. The floor is currently being conserved by an expert team from the Department of Antiquities led by Dr. Lefteris Charalambous. A third mosaic fragment was identified approximately 3 meters lower along the cliffside. This mosaic was mostly buried by a large bedrock fragment that had eroded from the site after it was abandoned. The KUSP team removed the bedrock fragment and revealed a 2 x 2 m floor mosaic. This floor was conserved by the Department of Antiquities and reburied. The conservation process revealed a mosaic decorated with a geometric pattern of lozenges and swastikas. The KUSP excavations also uncovered a large water installation measuring 9.6 x 1.7 m which is estimated to be at least 82 cm deep. This was also on the edge of the cliff and only its foundations survive. The foundational material suggests a date between 450 and 525 AD for its construction. The basin was modified at least twice during its use-life and appears to have been abandoned but not destroyed. The Kourion Urban Space Project revealed an early Byzantine cityscape that was first occupied after the 4th century earthquakes in an area of exposed bedrock during the Roman period. The Byzantine inhabitants manipulated the terrain, creating level spaces to access new water resources (cisterns) which would have been needed following the destruction of the main urban aqueduct in the earthquake of 365 AD. The area also included at least one elite structure along the cliffside, well placed (or located) to catch the sea breezes. This structure, evidenced by the mosaic floors, may have been an urban villa contemporary with the House of Eustolius. Further excavations will determine the date and nature of these elite structures.